Ecublens, Switzerland: – Dec Group, a leading provider of powder handling systems to the global pharmaceutical, chemical, food and cosmetic industries will use the upcoming FCE Pharma trade show in São Paulo to find a new Brazilian sales representative for its best-selling range of advanced powder handling systems and process containment technologies. 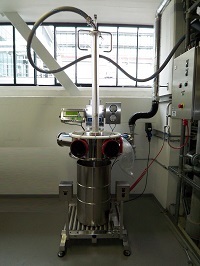 The Dec Group team at Booth E36 at FCE Pharma 2014 will also be demonstrating some important new products, including the DCS Drum Containment System for emptying drums respecting high containment requirements (< 1µg/m3), along with the PTS (Powder Transfer System) and the micronizing system MC Jetmill 300. “We attended the PTX exhibition in São Paulo last year and our return to the city is an indicator of how important to us the expanding Brazilian Market has become,” said Dec Group Marketing Head Gabriela Mikhaiel. “With an estimated 20,000 people likely to attend the 2014 FCE Pharma event, this is a great platform for us to raise our profile in Brazil. It’s also a great opportunity for a company with a strong Brazilian network to partner with us to provide an outlet for our innovative and largely patented range of particle size reduction, i.e. micronizing, process containment and powder handling solutions,” commented Ms. Mikhaiel. “Visitors to our stand will be able to see for themselves the quality of Dec engineering and also meet our specialists to benefit from their unique insights and deep knowledge of powder transfer and handling technologies,” she added. Dec Group is a leading global provider of powder handling systems and is recognized as a world-leading expert in process containment technologies. It has been supplying the pharmaceutical, chemical, food and cosmetic industries for more than 25 years. The FCE Pharma Exhibition is an annual event focusing on the production chain in the pharmaceutical sector. The 2014 event will be held at Transamerica Expo Center in São Paulo, Brazil, on May 12-14, with some 600 brands on display and specific national pavilions for India and China. FCE Pharma 2013 attracted almost 20,000 visitors from around the world, representing a host of pharmaceutical industry professionals connected with manufacture, supply and distribution of products and services including packaging, labeling, machines and equipment, quality and contamination control, transport and logistics, outsourcing and consultancy, laboratory and analytical equipment, process equipment, valves, sprays, industrial automation, technology and printing services. Organisers NürnbergMesse Brazil have announced that the 2014 event will feature a different format for the FCE Pharma Seminar with interactive panels, roundtables and lectures by leading industry players. It will also feature the first Powtech Arena, bringing together leading professionals and global companies working with powders and granulates. Click on Dec seeking Brazilian partner at FCE Pharma show for other information.